I was a slow convert. For years, I had watched these Kenyan children come to our country but didn’t get involved. My mum hosted some of them from the very first “Singing Kids” tour and sponsored a child for years. Each tour came and went with different children but still I didn’t feel inclined to take part. Then, in 2016, the kids were in the Stirling/Alloa area, near to where my family have a restaurant. I was on duty that day and I met the older boys, Kombe, Simon and George, and it went from there. In August that year, a friend bought me a ticket to go and see them in Livingston on the 2ndSeptember, which just happens to be my birthday. They were brilliant, as they always are, and I was invited to a party the next day – where I met Sammy, a wee boy who changed my life. pregnancy that their child was not going to survive – or indeed for how long. I had become adept at hiding the pain but Sammy (pictured here with Annette) changed everything. I remember my first memory of him was that we were chatting on my birthday – that day in 2016 – and he went away and then came back to see me with a ‘Freddo’ chocolate (other brands are available! – Ed), a custard cream biscuit, some birthday cake and … a cold meat ball! As he presented these gifts he was singing ‘happy birthday’ and it started from there. It was like my heart was ignited and I’d found love again. Sammy was about 10 or 11 then and there was something about him, the way he looked at me. I’ve noticed this with all the Kenyan children: it’s an unconditional love that we don’t see enough these days. They don’t love us because they want to get something – they love us because they want our friendship. They don’t look at you and judge you and I think that’s because of their background. You hear the stories about what it’s like, but nothing prepares you for the first time you step into the village. Looking at the pictures of the school when you’re safe and secure in the UK is one thing, but it’s only when you see it with your own eyes that you realise just how poor they are. Despite that, they embrace life and they can go from living what is, for them, a totally alien way of life in the UK when they are on a tour, but when it comes to time to return home, knowing what they are returning to, it doesn’t faze them. What drives them is the education they get in the school: knowing that through education they can make a difference for their families and their villages. Here, in our prosperous country, we have so many choices in life, yet the only choice these kids have is their education. The work that the Educate the Kids charity does is phenomenal. What impresses me the most is that every penny raised goes to the kids – everyone is a volunteer. There are not many charities that can say that – and Maureen and her family are the glue that holds it all together. Sometimes I think Maureen is an angel in human form. And on that subject, and before you ask, although Maureen and some of the people involved are Christian, the charity does not ask anyone their religion. 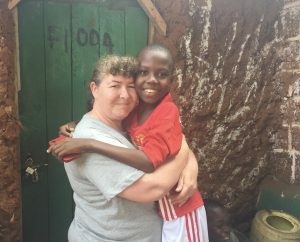 The kids themselves in Kenya are a mixture of Muslim and Christian, but it’s totally irrelevant to who gets into the school and how they are treated. That’s how it should be – so please do get involved if you can. You will be touched by the joy of the children and our donations really do transform their lives. That wee boy I met just those few years ago has certainly transformed mine.